You've most likely heard the saying, "Nothing succeeds like success", which alludes to the fact that people will continue to be considered good at what they do based on having done something correctly in the past. This certainly applies to show business. However, there is another saying which comes from Hollywood -- You're only as good as your last movie. So, to recap this contradiction, in the movies, having done well can certainly open doors, but you'd better keep doing well. This is why we get hype when a filmmaker delivers the follow-up to a hit film. Will they strike gold again, or will their reputation be tainted. This must have been the situation facing those behind Dark Water. Due to her impending divorce, Yoshimi Matsubara (Hitomi Kuroki), is forced to find a new place to live for herself and her young daughter, Ikuko (Rio Kanno). They wind up in an older building, but it seems acceptable, as it's near a good kindergarten and it's supervised by a superintendent. While dealing with the dissolution of her marriage, which is not going well, Yoshimi begins to notice some odd things about the building. The wet spot on the ceiling above her bed continues to spread, a child's purse, which Ikuko finds, keeps disappearing and re-appearing, and a Yoshimi gets glimpses of a young girl near an apartment upstairs. As the pressure of the divorce proceedings continues to mount, Yoshimi suspects that something strange may be happening to Ikuko. Director Hideo Nakata struck gold in 1998 with Ringu, an adaptation of a novel by Koji Suzuki. That movie was a hit in Japan, became a cult phenomenon in the United States, and lead to a very popular American remake which appeared in 2002. Technically, Nakata and Suzuki worked together again with 1999's Ringu 2, although that movie only used characters from Suzuki's books and wasn't based directly on one of his novels. (The story behind the Japanese Ringu sequels is fascinating.) Dark Water marked the true reuniting of the two men, as the film is based on a novel by Suzuki. Fans of Ringu couldn't help but be excited to see these two masters of horror together again. When most of us think of Ringu, all that we remember is the shocking ending (it may seem predictable and cliched now, but the first time I saw it, my jaw dropped). However, if you go back and watch the movie again, you'll see that it is a slow-burn, as Nakata very deliberately builds the mystery piece-by-piece. It's slow, but it's engrossing. Dark Water offers a similar slow pace, but the movie doesn't pull you in in the same way that Ringu did. The opening carries some emotional weight, as we feel for Yoshimi and Ikuko and we want to see them get back on their feet. However, following the introduction, the movie becomes very repetitive. Yoshimi has a meeting with her lawyers, Ikuko runs off, the water stain on the ceiling grows, Yoshimi spots a strange girl. And repeat. And repeat. It's very clear that the circular structure of the story (a ring?) is meant to represent how Yoshimi feels trapped in her life and students of film symbolism could have a blast with this movie, as it carries many themes of life and emotional separation. However, those seeking a good story won't find much to cling to here. This lies in the fact that the movie never sticks to any genre. Ostensibly, this is a horror movie, as it contains a ghost, but it's never scary or creepy. How can the man who brought us the ending of Ringu make a movie which isn't the least bit creepy? The movie contains elements of a mystery, as Yoshimi tries to figure out what happened to the girl. This is mildly interesting, but the revelation is presented in a rather mundane way. In actuality, this is a bleak drama, as we watch Yoshimi's world collapse. This all leads to the very dark ending, which leaves some unanswered questions. Dark Water certainly has potential, as Nakata creates a very distinct version of an urban hell with the dark, water-soaked apartment building. But, the story is both too dense and too vague at the same time and we feel as if we are watching the same scenes over and over. 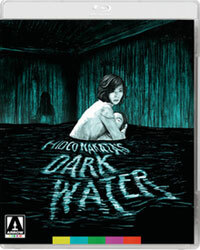 Dark Water will have you reaching for a bottled water on Blu-ray Disc courtesy of Arrow Video. The film has been letterboxed at 1.85:1 and the Disc contains an AVC 1080p HD transfer which runs at an average of 36 Mbps. I'll be blunt -- this is one of the worst transfers which I've ever seen. Any time a character movies, they leave trails behind them. I've never seen anything like it. There are constant echoes on image and the image is incredibly soft. It was like watching a 240p video on YouTube. The picture is also somewhat dark and the colors are drab. I watched this on three different Blu-ray players and got the same results each time. The Disc carries a DTS-HD Master Audio 5.1 track which runs at 48 kHz and an average of 3.8 Mbps. The audio fares much better than the video. The track offers some nice stereo and surround effects which illustrate the strange sounds coming from the building. The subwoofer effects kick in when the ghost appears. These help to add some presence to the dismal visuals. The Dark Water Blu-ray Disc contains several extras. "Hideo Nakata: Ghosts, Rings and Water" (26 minutes) is a modern-day interview in which the director discusses his career, most notably his foray into horror. "Koji Suzuki: Family Terrors" (20 minutes) allows the author of the Ring trilogy and the story behind Dark Water to talk about his works and his approach to horror. "Junichiro Hayashi: Visualizing Horror" (19 minutes) introduces us to Nakata's frequent director of photography, who talks about his work on horror films. "Making-of Featurette" (16 minutes) is an archival piece from 2002 which takes us on the set of the film, and is made up completely of "fly on the wall" video which shows key scenes being shot. Next, we get archival interviews with star Hitomi Kuroki (8 minutes), actress Asami Mizukawa (5 minutes), and Composer Shikao Suga (3 minutes). The extras are rounded out by a TRAILER, a TEASER, and three TV SPOTS.